This week’s featured community member is Marko Markolovic. He’s also a ShowMe Ambassador and you’ll see Marko’s name around here on the blog more often. Definitely check out his lessons on Economics and Macroeconomics ! Thanks for all of your help Marko! I have been a Social Studies teacher for 11 years, the last 4 of which have been at Blind Brook High School, which is 20 to 25 minutes north of New York City. I teach AP Macroeconomics, AP Government and Politics, Law, and Economics to both 11th and 12th graders. Blind Brook High School presents an excellent environment to teach in because of the wonderful and dedicated students. My favorite subject (besides the ones that I teach) really is everything to do with technology and how the educational experience can be impacted by technology. I record my AP Macroeconomics lectures on the ShowMe app and then email my students a handout to help organize the formation of their notes. In the classroom, I try to bring various real life problems that I have students discuss and solve in a collaborative environment. I strive to create an environment where students are using higher order thinking skills and problem solving techniqued to develop a deeper understanding of the course content and the world around them. In turn, I’m hoping to create well-informed citizens. I also try to formatively assess the students’ understanding to foster an environment where the instruction can be more tailored to individual needs as apposed to a one-size fits all approach to teaching. What’s the coolest ShowMe you’ve ever seen? The coolest ShowMe I have seen was on Gerrymandering. I thought it was well-done and made a complex topic easily understood. I think that the ability to rewind, pause, and fast forward has been very effective for my students to review and learn content at their own pace. 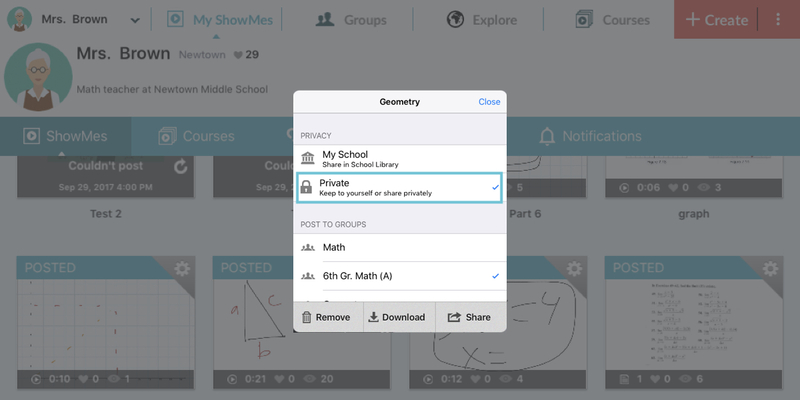 ShowMe’s have provided students this opportunity, and I have noticed that students are more engaged and more comfortable in learning. Where do you see education technology headed? I think that educational technology, for the first time in my career, is focused not on the teacher but on the student and the approach the students takes to learning. I think that, going forward, educational technology is going to require more of the 1:1 formats that we read about having success at reaching every learner, as opposed to creating a one size fits all method of teaching or learning. I think that iBooks Author and digital resources give teachers the opportunity to create material catered to their students, rather than purchasing a physical textbook that needs to be replaced every 5 years. I think that tools like the iPad, the apps associated with the device, and the various Google applications available in the Cloud present the opportunity for students to collaborate and create original content in a meaningful way. Further, I think the future of technology allows for originality in its use and implementation rather than the cookie cutter, cut and paste sort of educational materials that have existed to date. I think the future of education technology is very exciting; but, in these economic times of do more with less and property tax caps, teachers are going to have to find their own ways to integrate technology at their comfort level. Free applications, like ShowMe, are an excellent resource to help facilitate that process. When you’re not teaching, where can we find you? When I’m not teaching or reading about the content that I teach or reading Flipboard or the 5 or so blogs about technology, I am at home playing with my twins, Julia and Jackson, who will turn 9 months old in a few weeks.